Selected for the National Poetry Series by Ada Lim n, I Know Your Kind is a haunting, blistering debut collection about the American opioid epidemic and poverty in rural Appalachia. In West Virginia, fatal overdoses on opioids have spiked to three times the national average. 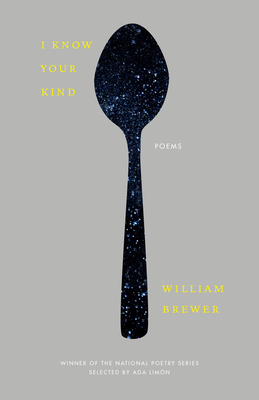 In these poems, William Brewer demonstrates an immersive, devastating empathy for both the lost and the bereaved, the enabled and the enabler, the addict who knocks late at night and the brother who closes the door. Underneath and among this multiplicity of voices runs the Appalachian landscape--a location, like the experience of drug addiction itself, of stark contrasts: beauty and ruin, nature and industry, love and despair. Uncanny, heartbreaking, and often surreal, I Know Your Kind is an unforgettable elegy for the people and places that have been lost to opioids. William Brewer is the author of Oxyana, which was awarded a Poetry Society of America National Chapbook Fellowship. His poetry has appeared or is forthcoming in Boston Review, Kenyon Review Online, The Nation, and A Public Space, among others. Brewer is currently a Stegner Fellow at Stanford University. He was born and raised in West Virginia.